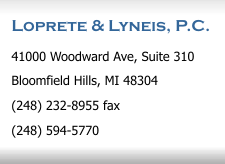 Jim LoPrete and Mary Lyneis have extensive experience in all aspects of estate and trust litigation. Disputes often arise concerning the validity of a Will or Trust - did the decedent lack capacity to sign the document, or was the decedent unduly influenced? Often the fiduciary fails to 1) follow the terms of the Will or Trust; 2) keep the beneficiaries informed; 3) act in the best interest of the beneficiaries; 4) follow the Michigan Prudent Investor Rule; or 5) keep estate or trust assets segregated from personal assets (commingling of funds). There are also situations when an individual is acting under a Power of Attorney during lifetime, and refuses to account to the beneficiaries after the death of the principal. We can assist either the beneficiaries or fiduciary in resolving any controversy that arises through probate court proceedings or mediation.